Gov. Jerry Brown on Sunday signed a bill making California the first state to require public companies to have at least one woman on their board of directors to advance gender equality and help break the corporate glass ceiling. The bill, SB 826, by Sens. Hannah-Beth Jackson, D-Santa Barbara, and Toni Atkins, D-San Diego, was designed to combat bias against experienced, qualified female employees in the workplace. In a rare move, Brown included a message with the bill’s signing. Brown went on to say that corporations have been “considered persons” for a long time — even before women were allowed to vote. “Given all the special privileges that corporations have enjoyed for so long, it’s high time corporate boards include the people who constitute more than half the ‘persons’ in America,” the governor said. Advocacy groups also applauded the bill’s signing Sunday. The legislation would mandate that all publicly traded California companies have at least one woman on the board by the end of 2019. By the end of 2021, it calls for at least two women on boards with five directors. At least three women will be required on boards of companies with at least six directors. Companies that don’t comply will be fined $100,000 for their first violation. Many big California companies have had women serve in prominent roles. In 1999, Carly Fiorina became the first woman to lead a Fortune 20 company as the CEO of Hewlett-Packard. Meg Whitman served as CEO of both eBay from 1998 to 2008 and Hewlett-Packard from 2011 to 2015, where she presided over its strategic split and serves on the Hewlett-Packard Enterprise board. 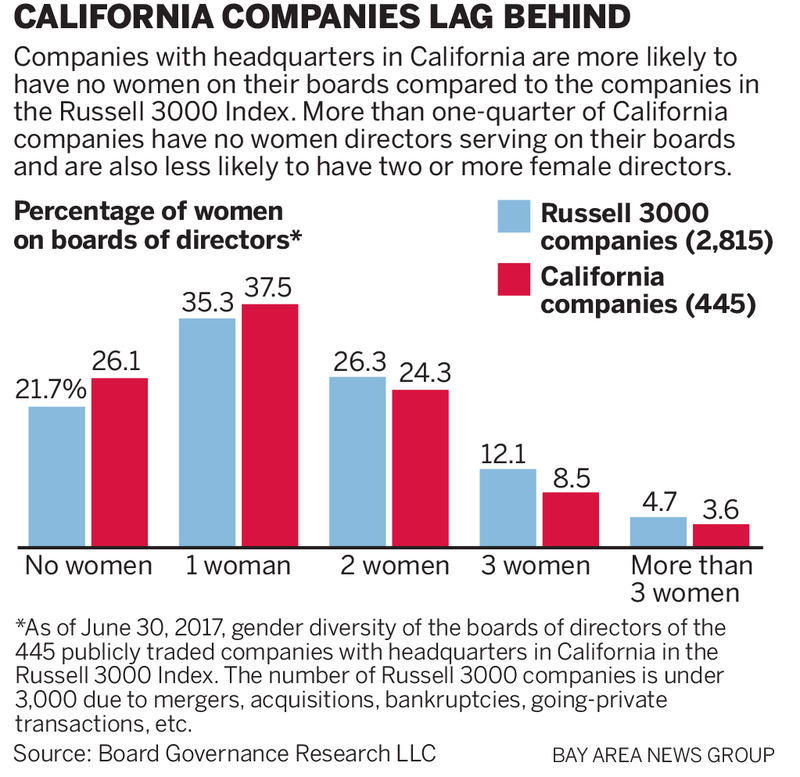 But as of June 2017, 26 percent of the 445 publicly traded companies in California had no women on their boards, despite some studies that suggest companies with women on their boards perform better. Harmeet Dhillon, a committeewoman for the Republican National Committee and a San Francisco lawyer, was opposed to the legislation even though she said she has experienced gender discrimination in her own legal profession. While she agreed that “it would probably be better for American businesses if they had more diversity on their boards — women and minorities,” she said that “having the government mandate that is completely ridiculous and counterproductive to how businesses should be run. “When you have mandates, you’re going to have every woman who gets that board appointment question whether she got that on her own merits,” Dhillon, who also warned about increased litigation over the issue, said Sunday. But the bill’s co-author, Jackson, felt it was necessary because she wasn’t seeing any progress. An “aspirational” resolution that she wrote in 2013 urging corporate boards to voluntarily add women “fell on deaf ears,” with the percentage of women on corporate boards barely inching up from 15.5 percent in 2013 to 16 percent five years later. Jackson added that “it’s no coincidence” that the company of disgraced movie mogul Harvey Weinstein, ousted in an avalanche of sexual harassment and abuse complaints from actresses, had no women on its board.